Jewelry vs Jewellery - Which one is the correct spelling? For those who love jewelry, one of the most confusing elements is how to spell it correctly. In this article, we will give you both spellings and tell you their differences. Spoiler Alert: Both Jewelry and Jewellery are both correct spellings. When Shaw uttered those immortal words, he had no idea how close to the truth of the matter he was. English is the most widely spoken language on earth. British English is the dominant variation. But we also have American English that is unique to North America or most of it. Depending on where you are in Canada, you may see one or the other being used. The simple answer is that both spellings are correct. Jewelry is how people in the USA spell it. Jewellery is how people in the UK (and rest of the English-speaking world) spell it. Why is there American English? But Spanish and French are also widely spoken, and we never hear terms like ‘Mexican Spanish’ or ‘Madagascan French’, so why do we need American English? The answer is that we Americans took it upon ourselves to simplify the spelling of many words. Over time they have become the accepted way of doing things here. Sometimes, English scholars imply that we had to simplify things because we aren’t intelligent enough to get it right. The truth isn’t quite so insulting as that! British English is a curious mix of Latin, French, and German, and many of those influences survive to the modern day. When America was still a young country, many of the settlers were largely uneducated. They used literal spellings when writing which, if you think about it, makes perfect sense. Webster’s Dictionary, produced in 1831 cemented this habit in the lexicon of the nation, and American English was born. 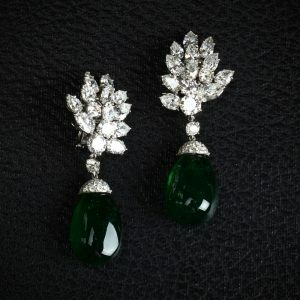 One of the words which demonstrate this phenomenon perfectly is jewelry. Or jewellery. The double ‘L’ in many words in British English is a giveaway of their French origins. Grammar rules dictate that any double letter inclusion must be followed by a vowel. Hence the ‘E’ in jewellery being a requirement. In the USA, we don’t concern ourselves with too many unnecessary rules and regulations, being the land of the free. We dispensed with this archaic – and very foreign in all senses of the word – concept of letters for letters’ sake. This single-double idiomatic of the noun then continues into the verb, with jeweled being the standard here, and jewelled being used in Britain. British people will always argue that they are right and we are wrong, as it is their language (with the clue being in the name), and they may be right about being right, but American English spellings are used routinely by 325 million people, so how can that be wrong? Here are the countries that use different translations. The fact is that language is a complex and really quite subjective thing. Nowhere is this more evident than in the differences between British and American English. Theater or theatre? Meter or metre? Colorize or colorise? Advertize or advertise? Wait, we don’t use advertize? Advertise is one of the few such words on which we all agree, but nobody seems to know exactly why. It’s likely that, as the word has only really come into common usage in relatively recent times, there was only ever really one version, and so it was adopted as a universal spelling. We’re happy, though, to stick with jewelry, jeweled and the rest, because we’re just as right as anybody else.